1. JOHN SR1 BRADLEY was born 30 Nov 1676 in St. Stephens Parish,Northumberland Co., Va, and died 16 Jan 1762 in Middlesex Co VA. He married (1) MARY RHODES 02 Nov 1711 in Middlesex Co VA. She was born 05 Jan 1684 in Middlesex Co VA, and died 15 Mar 1726 in Middlesex Co VA. He married (2) REBECCA HACKNEY 24 Aug 1728 in Christ Church Parish, Middlesex Co., Va. She was born 03 Feb 1694 in Christ Church Parish, Middlesex Co., Va, and died 1780 in Caroline County Virginia. i. WILLIAM2 BRADLEY, b. 1712; d. 17 May 1794, Culpepper Co VA.
ii. HEZIKIAH BRADLEY, b. 1712; d. 1790, Cumberland County Virginia. iii. ELIZABETH BRADLEY, b. 1715.
iv. JOHN BRADLEY, b. 28 Oct 1718, Middlesex Co VA; d. 1782, Cumberland Co VA.
v. ROBERT BRADLEY, b. 1720, Middlesex Co VA; d. 1785, LOrange Co VA.
vi. ANNE BRADLEY, b. 05 Jul 1725, Middlesex Co VA.
vii. JAMES2 BRADLEY, b. 1729, Middlesex Co VA; d. 1787, Caswell Co NC. viii. MARY BRADLEY, b. 1732, Middlesex Co VA.
2. JOHN2 BRADLEY (JOHN SR1) was born 28 Oct 1718 in Middlesex Co VA, and died 1782 in Cumberland Co VA. He married (1) PHOEBE HOLLOWAY daughter of JOHN HOLLOWAY and HANNAH SPIERS in 1740 in Goochland Co., Va, She was born 1720. He married (2) MARY LEDBETTER in Brunswick VA. She was born 1733, and died 1779.
i. JONAS3 BRADLEY, b. 1742, Cumberland County Virginia; d. 1814, Burkes Co GA..
ii. MARY PHEBE BRADLEY, b. 1747, Cumberland County Virginia; d. 1817, Cumberland County Virginia; m. JOHN DUNCOMB; b. 1748, Stafford Co VA; d. 1827.
iii. WILLIAM DANIEL BRADLEY, b. 1749, Cumberland County Virginia; d. 20 Jun 1794, Cumberland County Virginia. v JOHN W BRADLEY, b. 10 Aug 1751, Cumberland Co VA; d. 23 Aug 1847, Wilson Co TN. vi SARAH BRADLEY, b. 1753, Cumberland County Virginia; d. 1801, Cumberland County Virginia; m. THOMAS HOLLAND. vii NANCY BRADLEY, b. 1759, Cumberland County Virginia; m. WILLIAM SAMUEL BROWN; b. 1755.
viii JENNY BRADLEY, b. 1757, Cumberland County Virginia; d. 1825; m. GEORGE ANDERSON Cumberland Co VA; b. 1750; d. 1816.
x DAVID BRADLEY, b. 1761, Cumberland Co VA; d. 1811, Laurens SC. xii GEORGE WALTON BRADLEY, b. 1764, Warren Co NC; d. 1835, NC. 3. JOHN3 BRADLEY (JOHN2, JOHN SR1) was born 10 Aug 1751 in Cumberland Co VA, and died 23 Aug 1847 in Wilson Co TN. He married SUSANNAH ROWTON. She was born 1753, and died 1830 in Wilson Co TN. i. ELIZA4 BRADLEY, b. Cumberland Co VA; m. BILLY MINTER, 1794, Cumberland Co VA.
ii. 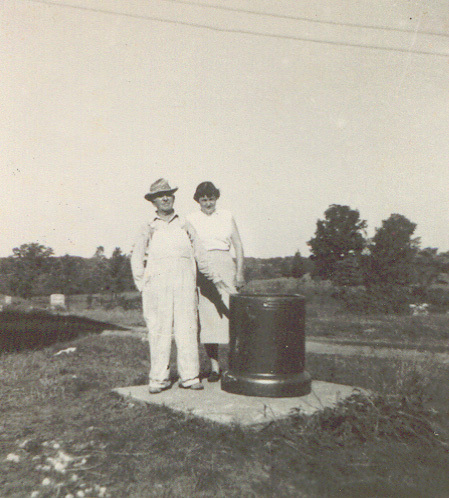 NANCY BRADLEY, b. Cumberland Co VA; m. WILLIS HOWERTON. iv. JOSEPH BRADLEY, b. 1776.
v. JOHN BRADLEY, b. 1782, Cumberland Co VA; d. 1845, Williamson County IL. vi. PLEASANT BRADLEY, b. 05 May 1789, Cumberland Co VA; d. 25 Sep 1845, Williamson County IL. vii. SUSANNAH BRADLEY, b. 1794; d. 1865; m. JOHN W WHITE; b. 1791, Albemarle Co VA; d. 1853, Wilson Co TN. viii. BARNETT BRADLEY, b. 1798, Albemarle Co VA; d. 1870, Il. ix. ELIZABETH BRADLEY, b. 1800. 4. HEZIKIAH3 BRADLEY (JOHN2, JOHN SR1) was born 1758 in Cumberland Co VA, and died 1809 in Cumberland Co VA. He married RACHEL BROWN. She was born 1758.
ii. JONAS BRADLEY, b. 1778; d. 1853.
iii. CLEMENT BRADLEY, b. 1785; d. 1817.
iv. SAMUEL B BRADLEY, b. 1789; d. 1846.
v. DAVID BRADLEY, b. 1790, Cumberland Co VA; d. 1881, Wilson Co TN. 5. DAVID3 BRADLEY (JOHN2, JOHN SR1) was born 1761 in Cumberland Co VA, and died 1811 in Laurens SC. He married NANCY SPIERS MEADOR 1785 in Cumberland Co VA, daughter of JONAS MEADOR and MARY HOLLOWAY. She was born 1767.
i. ELIZABETH4 BRADLEY, b. 1790.
ii. MARTHA BRADLEY, b. 1794.
iii. JONAS MEADOR BRADLEY, b. 1802.
iv. MARY BRADLEY, b. 1805.
v. NANCY BRADLEY, b. 1807.
vi. JANE BRADLEY, b. 1810. 6. GEORGE WALTON3 BRADLEY (JOHN2, JOHN SR1) was born 1764 in Warren Co NC, and died 1835 in NC. He married SARAH SALLY GOODBREAD 1791 in Rutherford NC. i. JOHN PHILLIP4 BRADLEY, b. 1806; d. 1865. 7. WILLIAM DANIEL3 BRADLEY (JOHN2, JOHN SR1) was born 1749 in Cumberland County Virginia, and died 20 Jun 1794 in Cumberland County Virginia. He married MARY PRICE ROWTON 22 Oct 1770 in Cumberland Co VA, daughter of WILLIAM ROWTON and ELIZABETH PRICE. She was born 1750.
i. PHOEBE4 BRADLEY, b. 1775.
iii. PHINEAS THOMAS BRADLEY, b. 1783, Cumberland County Virginia; m. ANNA B. BOATRIGHT, 22 Oct 1806, Cumberland Co VA.
v. WILLIAM PRICE BRADLEY, b. 1774; d. 1813. 8. WILLIAM4 BRADLEY (JOHN3, JOHN2, JOHN SR1) He married NANCY. iv. JANE BRADLEY, b. 1810.
v. SUSAN BRADLEY, b. 1816.
vi. NANCY BRADLEY, b. 1816. 9. JOSEPH4 BRADLEY (JOHN3, JOHN2, JOHN SR1) was born 1776. He married JANE 1804 in Albemarle Co VA. She was born 1784.
i. HENRY5 BRADLEY, b. 1810, Wilson Co TN; m. MARY; b. 1814.
ii. FRANCES BRADLEY, b. 1815.
iii. SUSAN BRADLEY, b. 1821.
iv. THOMAS BRADLEY, b. 1825. 10. JOHN4 BRADLEY (JOHN3, JOHN2, JOHN SR1) was born 1782 in Cumberland Co VA, and died 1845 in Williamson County IL. He married LUCY. She was born 1784, and died 1848.
i. SUSANNAH5 BRADLEY, b. 1805, Wilson Co TN; m. AARON ALEXANDER, 1829, Wilson Co TN; b. 1805.
ii. ELIZABETH BRADLEY, b. 1807; m. ANDERSON WALKER; b. 1804.
iii. CREED BRADLEY, b. 1813, Wilson Co TN; d. 1865, Williamson County IL; m. MARY A; b. 1823.
iv. JUDITH BRADLEY, b. 1814.
v. JAMES BRADLEY, b. 1819; m. NANCY T OLIVER; b. 1820.
vi. MARY A BRADLEY, b. 1821.
vii. NANCY BRADLEY, b. 1822.
viii. NEWTON BRADLEY, b. 1824. 11. PLEASANT4 BRADLEY (JOHN3, JOHN2, JOHN SR1) was born 05 May 1789 in Cumberland Co VA, and died 25 Sep 1845 in Williamson County IL. He married MATILDA NELSON. She was born 02 Jul 1794 in Cumberland Co VA, and died 1860 in IL. i. JUDITH5 BRADLEY, b. 1815, Wilson Co TN; d. 1884, Williamson County IL; m. (1) WILLIAM REESE; m. (2) EDWARD FRANKLIN; b. 1814.
ii. MARY ANN BRADLEY, b. 1816, Wilson Co TN; d. 1847; m. ADDISON REESE. iii. NELSON BRADLEY, b. 1819, Wilson Co TN; m. JANE H SANDERS; b. 1820, Tennessee; d. 1891, Williamson County IL. iv. ELIZA JANE BRADLEY, b. 1821, Wilson Co TN; d. 1848; m. HIRAM FOWLER; d. 1857.
v. MATHEW BRADLEY, b. 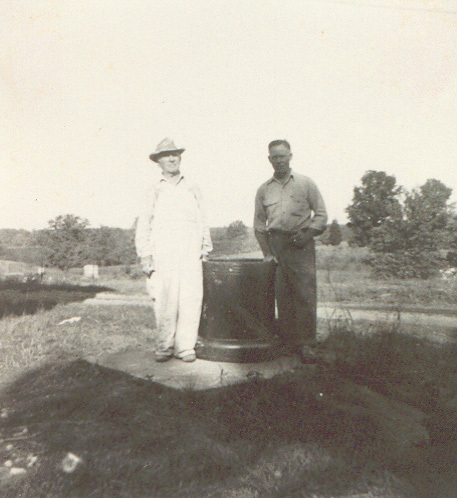 09 Mar 1824, Wilson Co TN; d. 1903, Il; m. JUDAH MCMAHAN. vi. DEMASCUS MARCUS BRADLEY, b. 1826, Wilson Co TN; d. 1915, Williamson County IL; m. JANE H SANDERS; b. 1820, Tennessee; d. 1891, Williamson County IL. vii. SUSAN ELIZABETH BRADLEY, b. 1828; d. 1857; m. HIRAM FOWLER; d. 1857.
viii. NANCY CAROLINE BRADLEY, b. 1831; m. JOHN G BOLES. ix. JASPER MCDALAND BRADLEY, b. 12 Aug 1833, IL; d. 1917; m. NETA ELIZABETH NEILSON, 22 Feb 1856, Williamson County Illnois; b. 1833, Tennessee; d. Nov 1903, Williamson County IL. x. JOHN WESLEY BRADLEY, b. 1836; m. TOURINA. xi. BEVERLY B BRADLEY, b. 1839, Williamson County IL; m. (1) AMANDA HENRIETTA COCKE; b. 1847; d. 1932. 12. BARNETT4 BRADLEY (JOHN3, JOHN2, JOHN SR1) was born 1798 in Albemarle Co VA, and died 1870 in Il. He married CYNTHIA SIMPSON. She was born 1805.
i. URILANT RYBOUR5 BRADLEY, b. 1829; m. MARTHA A BRATTON; b. 1836.
ii. JAMES M BRADLEY, b. 1832, Tennessee; d. 1906, Il; m. NANCY H MOAKE; b. 1856, Williamson County IL. iii. JOHN MARTIN VAN BUREN BRADLEY, b. 1834, Tennessee; d. 1915, Il. iv. SUSAN BRADLEY, b. 1837.
v. ELIZABETH BRADLEY, b. 1839.
vi. WILSON T BRADLEY, b. 1845, Tennessee; m. MARGARET E MOAKE. 13. DAVID4 BRADLEY (HEZIKIAH3, JOHN2, JOHN SR1) was born 1790 in Cumberland Co VA, and died 1881 in Wilson Co TN. He married MARY L FRAYSER 1815 in Cumberland Co VA. She died 1861.
iii. WILLIAM EDWARD BRADLEY, b. 1816; d. 1896.
iv. THOMAS BRADLEY, b. 1823.
v. ISAAC BRADLEY, b. 1824.
vi. MARY GAY BRADLEY, b. 1828.
vii. ANN ELIZA BRADLEY, b. 1830. 14. DANIEL ROWTON4 BRADLEY (WILLIAM DANIEL3, JOHN2, JOHN SR1) was born 1785, and died in Sumner Co TN. He married (1) MARY WINFREE. He married (2) JENNY HUDGENS 20 Jan 1808 in Cumberland Co VA, daughter of HOLLOWAY HUDGENS and NANCY BERRYMAN. She was born 1788, and died 1822.
i. DAVID5 BRADLEY, b. 1824, Sumner Co TN. ii. THOMAS BRADLEY, b. 1827, Sumner Co TN. iii. ELIZABETH5 BRADLEY, b. 1818.
iv. DANIEL BRADLEY, b. 1824, Albemarle Co VA.
7. HENRY5 BRADLEY (JOSEPH4, JOHN3, JOHN2, JOHN SR1) was born 1810 in Wilson Co TN. He married MARY. She was born 1814.
i. MARTHA F6 BRADLEY, b. 1841, Wilson Co TN. ii. SARAH E BRADLEY, b. 1843, Wilson Co TN. iii. JOSEPH H BRADLEY, b. 1847, Wilson Co TN. iv. NANCY BRADLEY, b. 1851, Wilson Co TN. 8. CREED5 BRADLEY (JOHN4, JOHN3, JOHN2, JOHN SR1) was born 1813 in Wilson Co TN, and died 1865 in Williamson County IL. He married MARY A. She was born 1823.
i. WILLIAM L6 BRADLEY, b. 1840.
ii. NANCY CLEMETINE BRADLEY, b. 1843; d. 1900.
iii. DAN M BRADLEY, b. 1846.
iv. ELIZABETH BRADLEY, b. 1850.
v. LUCINDA BRADLEY, b. 1851.
vi. ALONZO BRADLEY, b. 1853.
vii. JOHN BRADLEY, b. 1855.
viii. JAMES BUCHANAN BRADLEY, b. 1857; d. 1902.
ix. WILFRED BRADLEY, b. 1860.
x. WILLIS G BRADLEY, b. 1865. 9. JAMES5 BRADLEY (JOHN4, JOHN3, JOHN2, JOHN SR1) was born 1819. He married NANCY T OLIVER. She was born 1820.
i. LUCY J6 BRADLEY, b. 1841; m. BERRY PULLEY. ii. WILLAIM C BRADLEY, b. 1844; m. SARAH SELLER; b. 1854; d. 1908.
iii. SAMUEL WILSON OLIVER BRADLEY, b. 1847, Williamson County IL; d. 1923; m. SARAH WESTBROOKS. iv. MARY E BRADLEY, b. 1849; d. 1941; m. JAMES SANDERS; b. 1851; d. 1913.
v. JOHN M BRADLEY, b. 1853; d. 1927; m. RACHEL AISE; b. 1869.
vi. JAMES M BRADLEY, b. 1854; d. 1922; m. LOUISA SUNDAY. vii. MARTHA E BRADLEY, b. 1861; d. 1910; m. CHARLES BURNETT; b. 1861. 10. JUDITH5 BRADLEY (PLEASANT4, JOHN3, JOHN2, JOHN SR1) was born 1815 in Wilson Co TN, and died 1884 in Williamson County IL. She married (1) WILLIAM REESE. She married (2) EDWARD FRANKLIN. He was born 1814.
ii. NANCY6 FRANKLIN, b. 1834; m. HENRY BOLES. iii. GEORGE FRANKLIN, b. 1836, Williamson County IL; m. DELIA ELIZABETH HUFFMAN. iv. BARBARA FRANKLIN, b. 1839; m. PERRY RALLS. v. MARY FRANKLIN, b. 1841. 11. ELIZA JANE5 BRADLEY (PLEASANT4, JOHN3, JOHN2, JOHN SR1) was born 1821 in Wilson Co TN, and died 1848. She married HIRAM FOWLER. He died 1857.
i. HARRIET A6 FOWLER, b. 1848.
ii. ELIZABETH C FOWLER, b. 1853.
iii. ELLEN FOWLER, b. 1856.
iv. HIRAM FOWLER, b. 1857. 12. 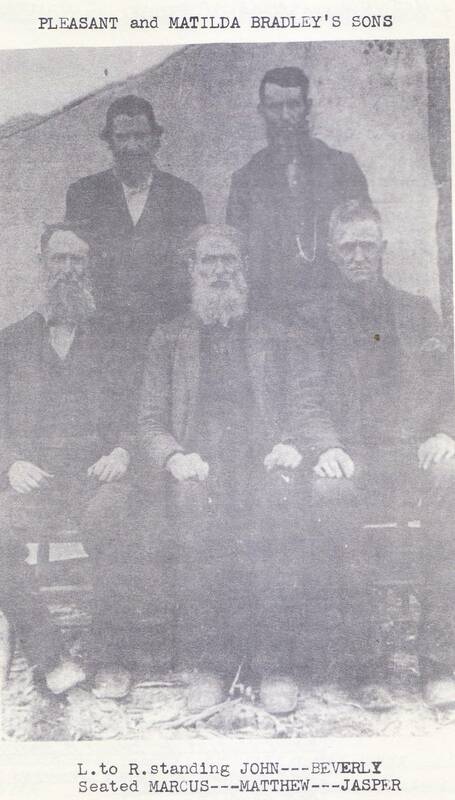 MATHEW5 BRADLEY (PLEASANT4, JOHN3, JOHN2, JOHN SR1) was born 09 Mar 1824 in Wilson Co TN, and died 1903 in Il. i. SARAH6 BRADLEY, b. 1850, Williamson County IL; d. 1943, Jackson Co MO. ii. ELIZA A BRADLEY, b. 1852; d. 1907.
iii. MARY MATILDA BRADLEY, b. 1855; d. 1904.
iv. NANCY JANE BRADLEY, b. 1856; d. 1899.
v. CYNTHIA ELLEN BRADLEY, b. 1858; d. 1901.
vi. ELVIRA BRADLEY, b. 1863.
vii. SUSAN BRADLEY, b. 1866.
viii. MARGARET BRADLEY, b. 1868; d. 1940.
ix. CHARLEY BRADLEY, b. 1873; d. 1951. 13. DEMASCUS MARCUS5 BRADLEY (PLEASANT4, JOHN3, JOHN2, JOHN SR1) was born 1826 in Wilson Co TN, and died 1915 in Williamson County IL. He married JANE H SANDERS. She was born 1820 in Tennessee, and died 1891 in Williamson County IL. i. MARY6 BRADLEY, b. 1849, Williamson County IL; m. JOSEPH THOMAS LINDSEY. ii. MARTHA BRADLEY, b. 1850, Williamson County IL. iii. JAMES BRADLEY, b. 1852, Williamson County IL. iv. SARAH ELIZABETH BRADLEY, b. 1854, Williamson County IL. v. HIRAM BRADLEY, b. 1858, Williamson County IL. vi. ADDIE LASKER BRADLEY, b. 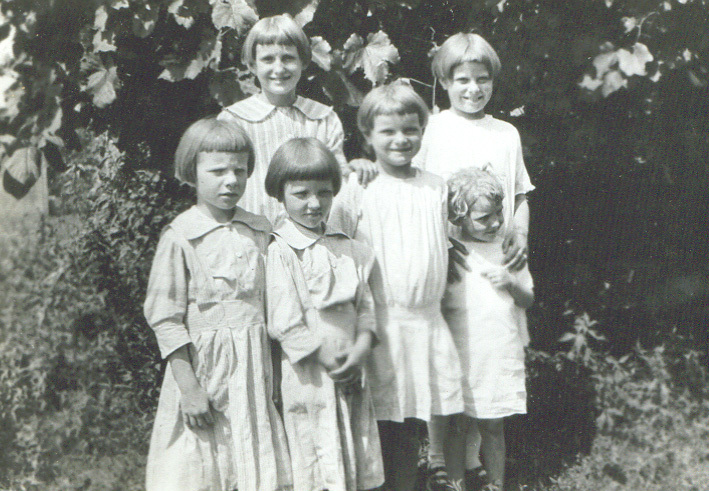 1860, Williamson County IL; d. 1949; m. ANNIE JACKSON; b. 1871; d. 1937.
vii. JOHN BRADLEY, b. 1862, Williamson County IL. 14. 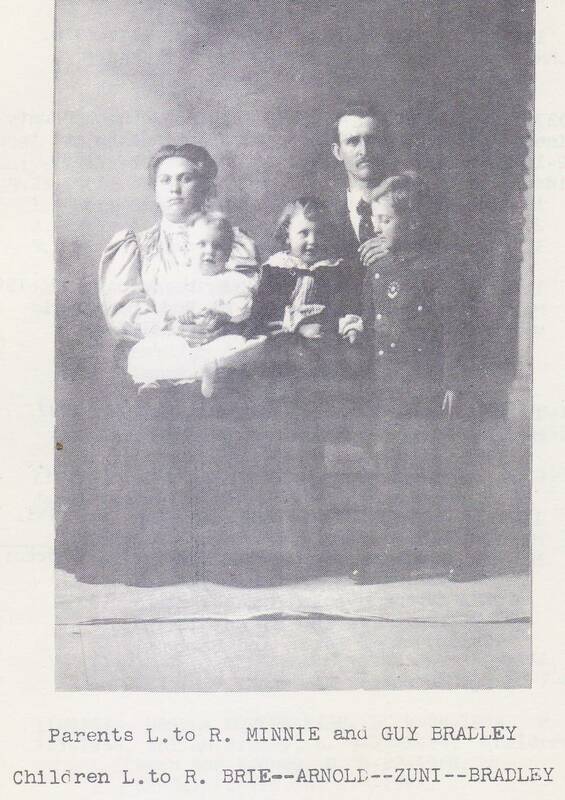 JASPER MCDALAND5 BRADLEY (PLEASANT4, JOHN3, JOHN2, JOHN SR1) was born 12 Aug 1833 in IL, and died 1917. He married NETA ELIZABETH NEILSON 22 Feb 1856 in Williamson County Illnois. She was born 1833 in Tennessee, and died Nov 1903 in Williamson County IL. i. MATILDA J6 BRADLEY, b. 1857, Williamson County IL; d. 1912; m. WILLIAM B PHILLIPS; b. 1852.
ii. THOMAS ALEXANDER BRADLEY, b. 12 Nov 1863, Williamson Co.IL; d. 1932, Goreville Johnson Co.IL. iii. WILLIAM M “MACK” BRADLEY, b. 1866, Williamson County IL; d. 1941. 15. 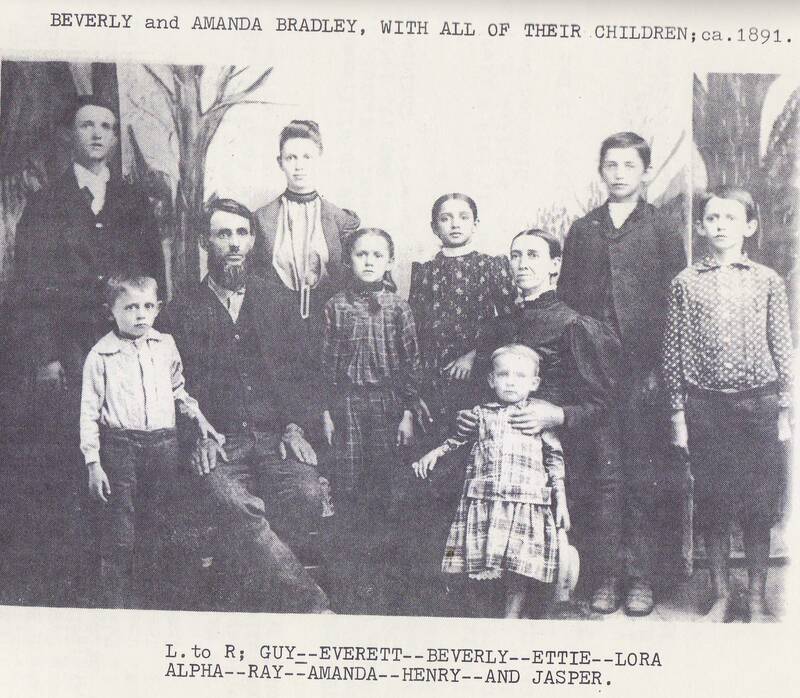 BEVERLY B5 BRADLEY (PLEASANT4, JOHN3, JOHN2, JOHN SR1) was born 1839 in Williamson County IL. 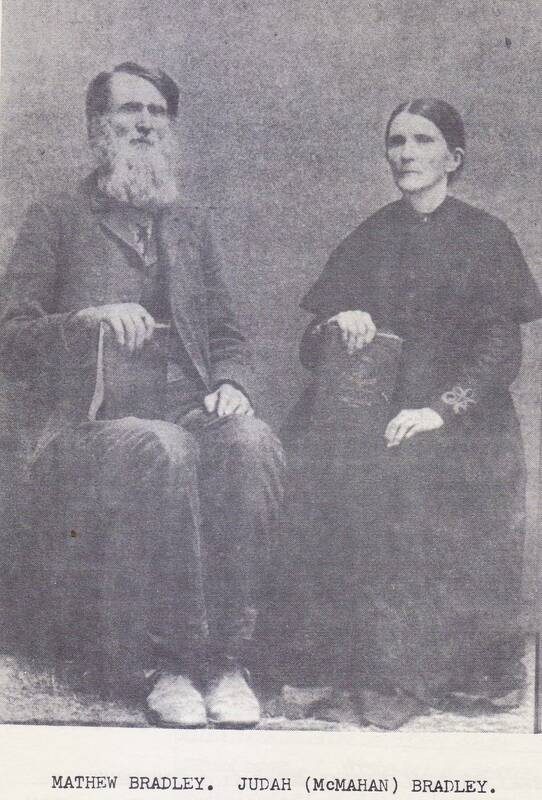 He married (1) AMANDA HENRIETTA COCKE. She was born 1847, and died 1932.
i. HENRIETTA6 BRADLEY, b. 1873, Williamson County IL; d. 1965, Williamson County IL. ii. GUY BEVERLY BRADLEY, b. 1876, Williamson County IL; d. 1912, Williamson County IL. iii. HENRY M BRADLEY, b. 1878; d. 1965.
iv. JASPER BRADLEY, b. 1879; d. 1894.
v. ALPHA J BRADLEY, b. 1880, Il; d. 1972, Parmer Co TX. vi. LORA L BRADLEY, b. 1883, Johnson Co IL; d. 1975, California. vii. EVERETT BRADLEY, b. 1885, Il; d. 1965, Svier Co AR. viii. RAY W BRADLEY, b. 1886, Jackson Co MO; d. 1955, Williamson County IL. ix. AMANDA MELVINA6 BRADLEY, b. 1861, Johnson Co IL; d. 1916, Jackson Co MO. x. JAMES ALLEN BRADLEY, b. 1863; d. 1869.
xi. MARY MATILDA BRADLEY, b. 1866, Johnson Co IL; d. 1924, Williamson County IL. xii. J W BRADLEY, b. 1868; d. 1869. 16. URILANT RYBOUR5 BRADLEY (BARNETT4, JOHN3, JOHN2, JOHN SR1) was born 1829. He married MARTHA A BRATTON. She was born 1836.
i. CHRISTOPHER COLUMBUS6 BRADLEY, b. 1859.
ii. MARTHA ELIZABETH BRADLEY, b. 1862. 17. MARY MATILDA6 BRADLEY (MATHEW5, PLEASANT4, JOHN3, JOHN2, JOHN SR1) was born 1855, and died 1904. She married ILLIAM CHRISTOPHER COLUMBUS FAIRLESS. i. LILLIE MYRTLE7 FAIRLESS, b. 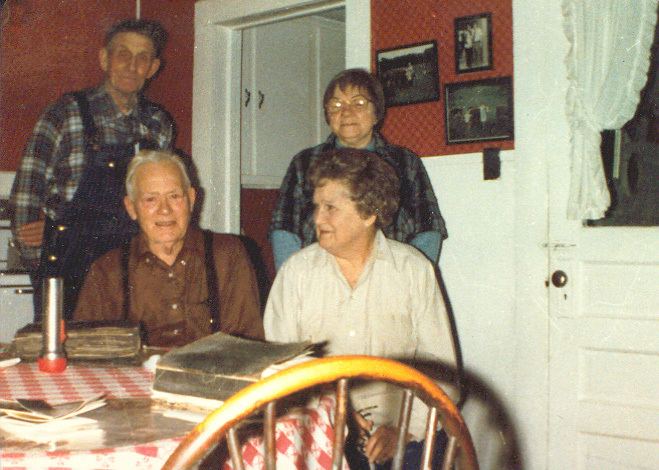 1890, Poplar Bluff MO; d. 1987, St Louis MO; m. EARL ELSWORTH DARE; b. 1893; d. 1950. 18. THOMAS ALEXANDER6 BRADLEY (JASPER MCDALAND5, PLEASANT4, JOHN3, JOHN2, JOHN SR1) was born 12 Nov 1863 in Williamson Co.IL, and died 1932 in Goreville Johnson Co.IL. He married ALICE NORA HUDGENS 15 Sep 1887 in Hudgens Williamson Co.IL, daughter of ZACHARIAH HUDGENS and MARY COOKSEY. She was born 20 Feb 1870 in Williamson Co.IL, and died 19 Feb 1934 in Williamson Co.IL. m. WARDON MOORE TROVILLIAN, 26 Jul 1907; b. 08 Apr 1885; d. 1959.
m. IZORA GRAVES, 10 Oct 1912; b. 10 May 1893; d. 16 May 1939.
m. (2) JOHNNY MARTIN, 26 Jul 1940.
m. BERTHA ESTELL NEWTON, 23 Sep 1919, Goreville Johnson Co.IL; b. 09 Sep 1900, Goreville Johnson Co.IL; d. 31 Jul 1980, Sprinfield IL. m. (2) JACK PERRY, 01 May 1937; b. 16 Oct 1887; d. 10 Mar 1960. 19. WILLIAM M “MACK”6 BRADLEY (JASPER MCDALAND5, PLEASANT4, JOHN3, JOHN2, JOHN SR1) was born 1866 in Williamson County IL, and died 1941. He married MINNIE MCINTURFF, daughter of COLUMBUS MCINTURFF(LUM) and SARAH BRADLEY. She was born 17 Oct 1869, and died 08 Jun 1951.
i. MAUREEN7 BRADLEY, m. TED HYDE. I have just finished check ing this info with what I and it is pretty much agreement. I am the dau of Don Bradley of Thomas of Jasper of Pleasant…….. This is were I descend from in this lineage of the Bradley family. My Bradley family is from Southern Illinois and would love to connect with the Rest of you so we can continue to add the family names to the list! the family lived in Brown county Indiana and most of them died there. they had 6 boys / an 1 girl Leatha ann Bradley Owes . do you know this family. and would you share with me if you do..
My Grandmothe is Sarah Lavina Bradley great grandmother Mary Jane Higbee and great great grandmother Lavina Webb, Higbee, and Hatchett or hatchet. Do you have any information for Lucinda “Lucy” Bradley Story Higgason? I am looking for a living direct descendant of William Brown and his second wife Nancy Bradley. Can you help me? I have their family Bible. I purchased it at a sale over 20 years ago and have not been able to find a family member. Do you still have this Bible? I meant to say “my” Robert Bradley (1720) and “your” John Bradley (1718). Sorry I can’t be of any help with your Y DNA……….. But thought I would take a chance to see if you have anything on John Bradley #2 b. 1718 and Phebe Holloway. I am descended from their daughter Mary Bradley and John Duncomb. Looking for proof of Duncomb marriage c. 1768. The usual places are yielding nothing. A Bible perhaps? Ministers’ records? Greetings from Texas! 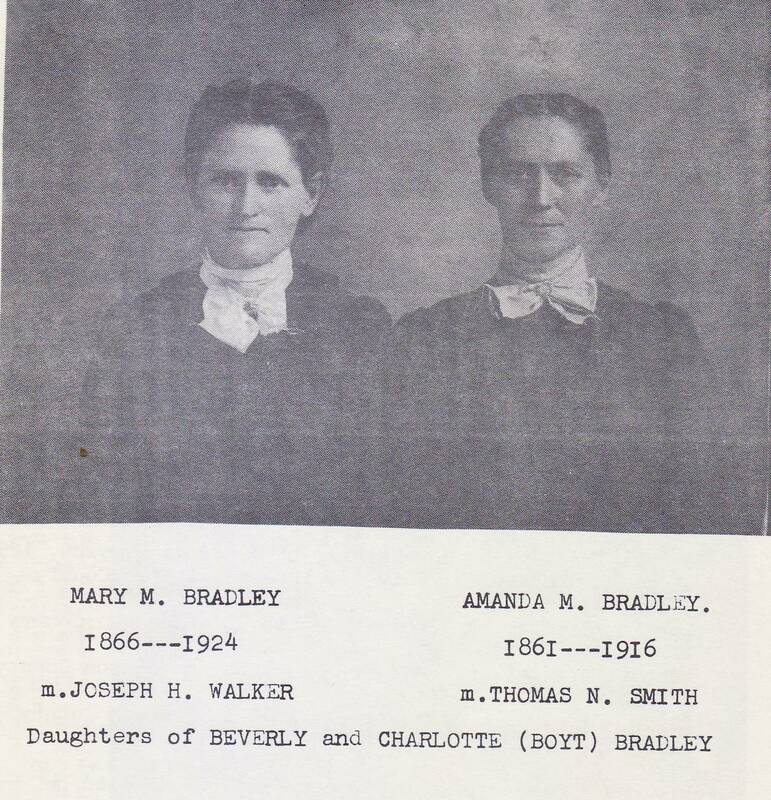 I am currently researching the Bradleys especially those that settled in Southern IL and AR. 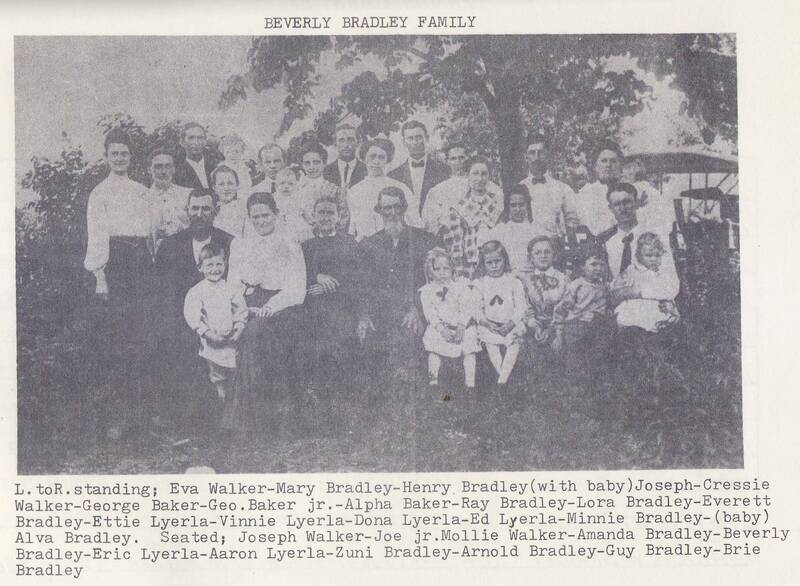 Any info on the Bradleys would be greatly appreciated no matter where they found roots. I would be blessed by any stories you might share. Can you clarify the purpose of the footnote marks on this page? I’m having trouble understanding how this is organized. Thanks!